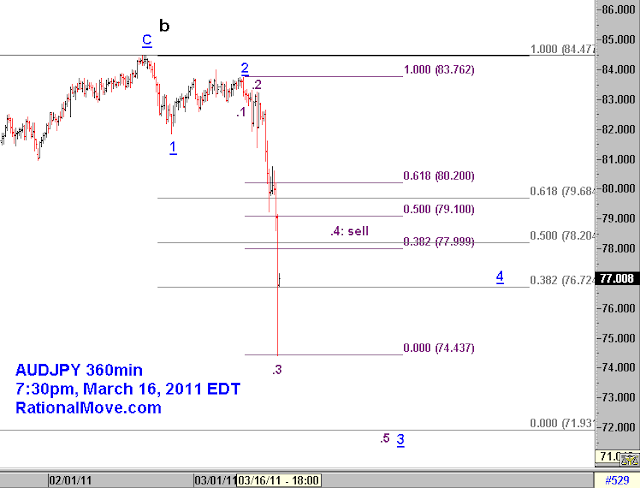 Update: The Elliott wave count and the trading idea in this article have been rejected. USDJPY moved 300pips in one hour this afternoon after USA told its military force supporting Japan to stay outside the 50 miles radius of the nuclear plants in Fukushima. 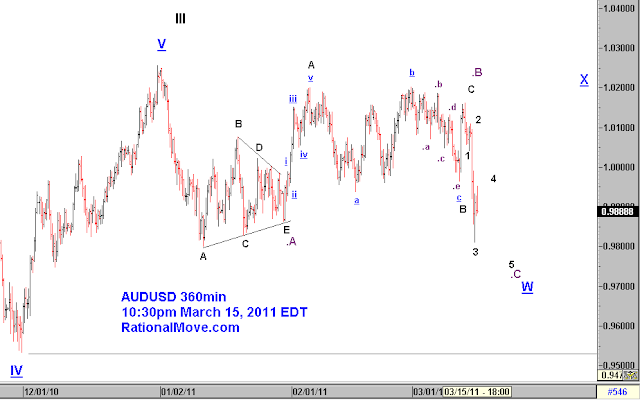 AUDJPY was also badly sold off. The move was so fast and violent and once it started, it was too late to enter the market. So, I stayed away of course. 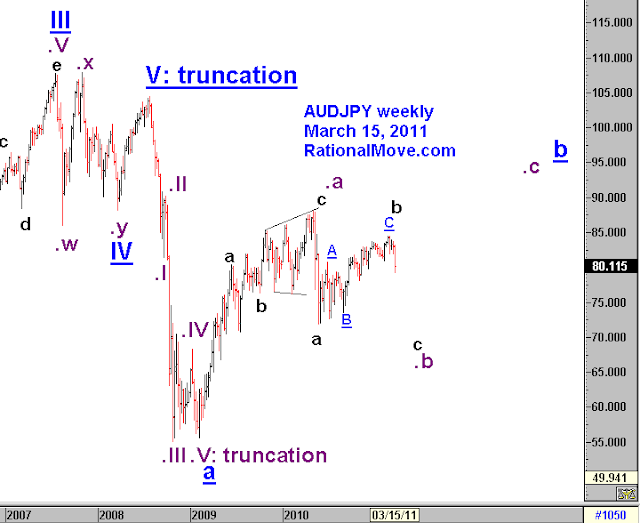 It’s funny I just wrote about the idea of selling AUDJPY. But I did not take position for a good reason. Zooming up to 6 hours chart, it’s a bit tricky to count, but I think 74.437 was the peak of the panic of the day and we are now seeing a clear rebound that I believe to be wave .4. 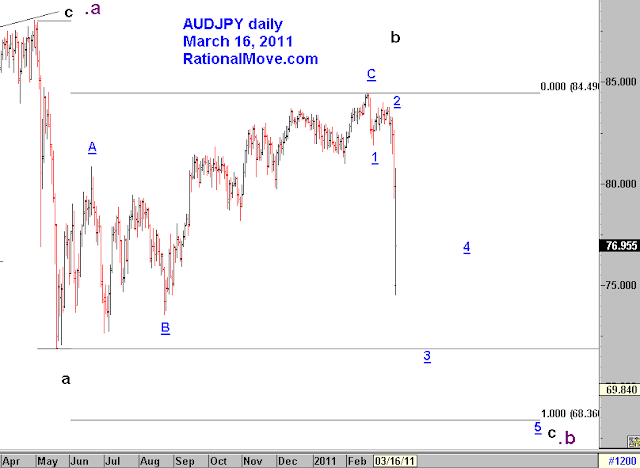 I think I can learn something from May 6, 2010 (flash crash). Though the usual sell zone is 38.2% rebound (78.00~), I won’t be surprised if it overshoots just it did after the first let of the flash crash (70+% rebound, click this link and check I and II of the 3rd chart). So, I would wait for a while to see how strong the rebound will be, and sell somewhere between 78.00~80.00 and set the stop loss at 82.00, a little above the low of 1 . 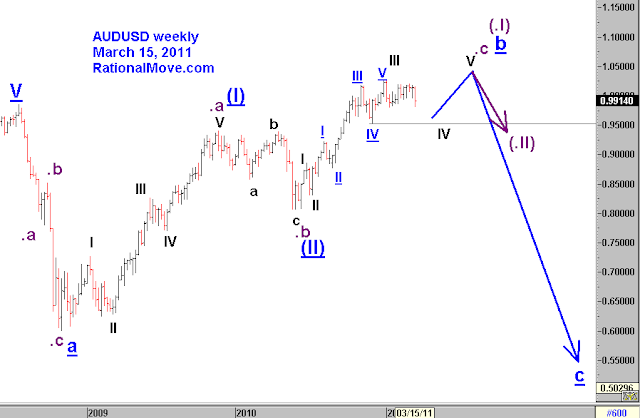 The ideal target is 72.00, but I’d be ready to take partial profit in the rapidly changing & abnormal market condition.